Legends say that the forefathers of Nanagada fled a far-off star to their new home. They say that the sky once hummed with metal flying machines and palatial floating cities. But then the Azteca came. Created and driven by cruel, inhuman gods, they swarmed out of the sky in search of sacrificial blood, and worse. To defeat them and their gods, the forefathers burned the sky. The cities and machines fell to the ground, useless. In the centuries since, Azteca have kept to their side of the mountains in an uneasy truce. But now it has been broken. Only one man can stop their bloodthirsty march: John deBrun. His family scattered, John holds the key to an ancient secret deep in memories lost just before he was dragged unconscious from the sea years ago . If he can stay alive long enough to uncover them, he might be able to stop the destruction of Nanagada. 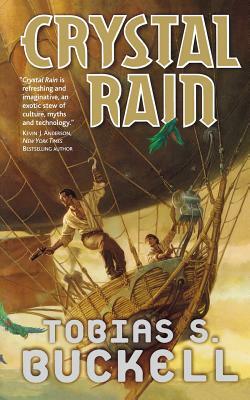 "Crystal"" Rain" is the first novel by one of science fiction's newest and most promising talents. Now featuring brand new cover art. TOBIAS S. BUCKELL is a "New York Times" bestselling author whose books and short stories have been translated around the world. Buckell hails from the Caribbean, where as a child he lived on boats in Grenada and the British and US Virgin Islands. When he was a teenager, a series of hurricanes destroyed the boat his family was living on and they moved to Ohio, where he still lives today with his wife and daughters.